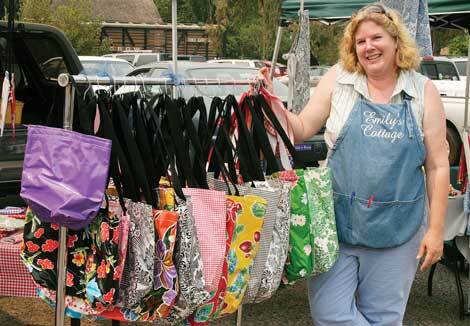 Emily Fitzpatrick sells water proof oil cloth bags from a small booth at Friday’s Farmers Market. “I’ve been sewing for over 30 years,” said Emily Fitzpatrick, whose grandmothers influenced her to start making her own clothes at age 13. The two women made skirts and tops for their young granddaughter, who taught herself on a Singer sewing machine she inherited from her father’s mother, and still owns. She even made her prom dresses. Fitzpatrick grew up in Southern California, studied business and interior design, then worked 10 years for fabric and furniture chain Calico Corners as a manager, salesperson and seamstress, making slipcovers and cushions. Nine years ago, she and her husband Kevin decided Sonoma was a better place to raise their son Nicholas. It reminded her, she said, of Costa Mesa in the 1960s, when she was growing up there. It’s a more family-oriented, trusting community, one where her son is safe riding his bike into town, she said. In Sonoma, Fitzpatrick continued making custom slipcovers and cushions from home. Shortly after moving here, she discovered oilcloth at the old Kay’s Fabric Shop, and realized she could make easy-to-care-for products for families, such as market bags and tablecloths. Oilcloth originally was made from canvas coated with oil paint to be waterproof. Fitzpatrick’s oilcloth is made in Mexico of polyester/cotton mesh with colorful vinyl on the front that’s waterproof, resists stains and lasts “almost forever”. Three years ago, Fitzpatrick started selling market bags in bright rainbow colors from a small booth at the Friday morning farmers’ market. Listening to her customers, she’s altered her products – adding pockets to her bags, for example – and continues to create new items, such as aprons, place mats and small purses. One she’s experimenting with right now is a black mat that children can write and draw on with chalk. It has a pocket for supplies and rolls up for car trips. Fitzpatrick makes everything herself in her home business, Emily’s Cottage, using an industrial sewing machine. Her son, now almost 13, cuts the handles for the market bags from polyester webbing, earning ten cents a pair. Two years ago, she decided she was ready for the crowds at the Tuesday evening market, where she also sells her wares. Fitzpatrick will make any of her oilcloth products to order, which includes special sizes or patterns, and also sells them on her Web site.